Reviews » Theatrical Reviews » Won't You Be My Neighbor? The new documentary about TV's Mister Rogers, Won't You Be My Neighbor?, is a love story, but not in the traditional sense. It's about love for humanity and its potential. It is also the year's first great tearjerker. Fred Rogers was the host of a handful of children's shows on public television, the longest-lasting being Mister Rogers' Neighborhood, which ran from 1968 to 2001. Most folks reading this review don't need to be told who Mister Rogers is. If he wasn't a part of your childhood, growing up in front of the TV, then maybe you've glimpsed him in any number of the video clips or memes that continue to circulate in the years since his death in 2003. Mister Rogers was good. In a world where everyone hides something -- no, Mister Rogers wasn't really a Navy SEAL -- Fred Rogers was merely a nice man who believed in spreading messages of love and kindness. During his time on the air, he sought to create an oasis of quiet and thoughtfulness in a television landscape dominated by bombastic imagery and hard-sell manipulation. The message of Mister Rogers and his cultural impact is the focus of director Morgan Neville's film, with less of a spotlight placed upon this unlikely celebrity's life story. Neville, whose previous work includes Best of Enemies and the Oscar-winning 20 Feet from Stardom, is a talented filmmaker but one who tends to rely in those earlier films upon rhythmic momentum over storytelling thoroughness. With Won't You Be My Neighbor?, he seems to take a cue from Mister Rogers and slows things down a little bit. Also, to the filmmaker's credit, he often gets out of the way of his subject here, by allowing Mister Rogers to mostly speak for himself. He augments archival interview footage and clips of Mister Rogers's shows with new interviews with friends and family. You can feel the filmmaker trying not to make a purely hagiographic film, but there's no dirt to dig up. One of Mister Rogers's sons jokes about the annoyance that comes from being related to the "second Christ." Neville traces the show's origins, beginning with Mister Rogers choosing television over his intended path as a Presbyterian minister. The film shows the way that Mister Rogers developed hand puppet characters who populated his lo-fi Neighborhood of Make-Believe, often from people in his own life. The most touching and heart-breaking of these characters is Daniel Striped Tiger, whose sadness and meekness echoes Rogers's own painful childhood as a pudgy, sickly child, who spent much of his time alone. Mister Rogers wasn't just trying to protect children from the world. He wanted them to be able to understand it and process it, even its most difficult and traumatic aspects. One of the film's most shattering moments replays a show segment with Daniel Striped Tiger, where he asks human character Lady Aberlin what "assassination" means. It was recorded days after the shooting death of Robert Kennedy. He also had a moral sense of justice. 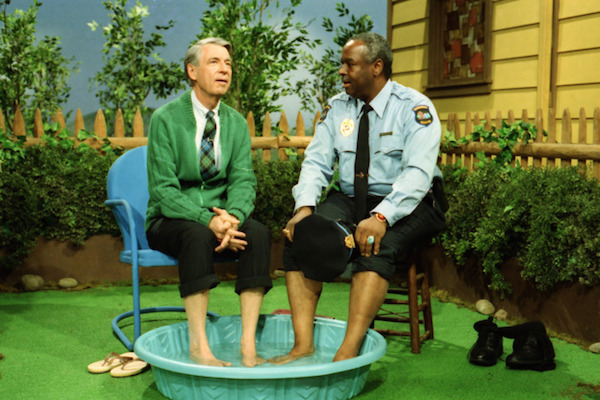 When he heard news stories of African-American children being ejected and physically abused for attempting to swim in "whites only" pools, he put a segment on his show where he shared a kiddie-pool foot bath with the show's African-American police officer character, Officer Clemmons. There's more to the story, and the film thankfully doesn't ignore it. Officer Clemmons was played by singer and actor François Clemmons, who was gay. While we would wish that Mister Rogers would be preternaturally enlightened, his first instinct was to tell Clemmons that he couldn't hang out in gay bars and be publicly gay anymore while continuing to be on the show. The film suggests that eventually Rogers came to accept Clemmons as he was, and that Clemmons considers him a father figure to this day. It's hard to imagine a more empathetic public figure in recent years than Mister Rogers. The downside is that too often he is misinterpreted as an out-of-touch, milquetoast dweeb, as many of the TV parodies included in the film make clear. 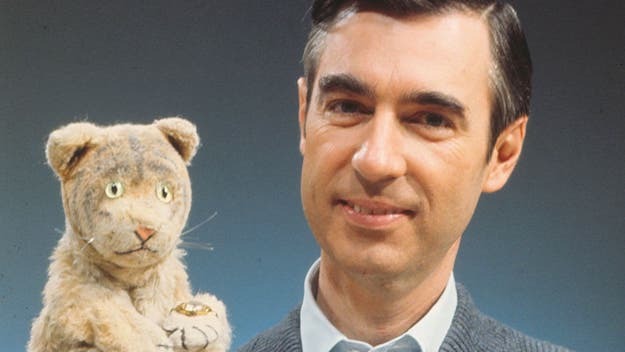 During an interview with Tom Snyder, Snyder grumpily asks Mister Rogers if he's "for real," only to be disarmed by the Daniel Striped Tiger puppet moments later. In more recent clips, such as those from Fox News, Mister Rogers is blamed for being "what's wrong with America," for having the temerity to listen to children and to suggest to them that they are special. Without being too schematic, the film makes it clear that the ability to listen and to be empathetic is something that we humans need to hang onto -- especially into these hot-tempered times. Our leaders and the media want to keep us divided, because it makes for good business. But, as Mister Rogers makes clear in Won't You Be My Neighbor?, shutting out the noise and listening to each other will get us all a lot farther. Order "Won't You Be My Neighbor?" now!